We had our daughter’s birthday party at High Meadows and it was fantastic. All the girls loved it! Sue was a great and they’re still talking about it! On Easter Sunday 2006, Luke fell while running through the fields in Florida and broke his elbow. The vet said it was one of the worst breaks that she had ever seen and that there was absolutely no hope of repair. He was in terrible pain and she strongly advised me that putting him to sleep was the only humane thing to do. I have never cried so hard in my life. Losing Luke was like my worst nightmare coming true. I had owned him for 10 years and he was the foundation of High Meadows Farms. Just about every student on the farm took their first lesson on Luke. His kind and gentle manner comforted even the most timid rider. From his “droopy lip,” to his “Mr. Slow Motion” attitude, to his ritual pooping on the crossties, he was loved by all. There is not a day that goes by that I am not reminded of one of his silly or predictable behaviors. I can rest assured that he his happily galloping through the fields of Heaven, and that his spirit will always he a part of High Meadows Farms. I love you Luke! 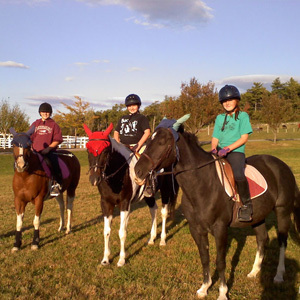 We offer horseback riding lessons year round in the Lakes Region of New Hampshire. In the Winter and Spring we are at 100 Acre Woods in Moultonboro, and in the Summer and Fall we are at High Meadows Farms in Wolfeboro. 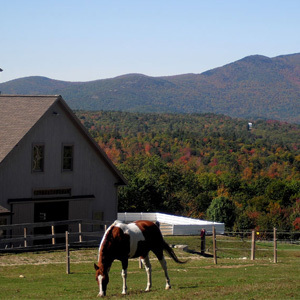 Both locations are offer beautiful riding arenas, miles of trails and breathtaking scenery. Come visit us anytime! This is the place to come whether your a first time rider looking for a great first experience on a horse, or if you're an experienced rider looking for something more then just your "typical trial ride." 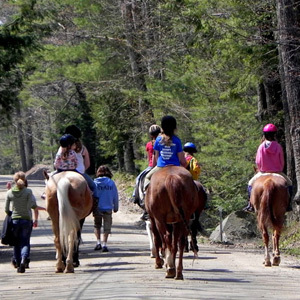 All trail rides are custom designed to fit each person's needs and are created to give you the "full experience" of horseback riding. Our trail rides are like no other around! If you would like to make a reservation or get information on lessons, parties, trial rides or more, fill out the form below and one of our staff members will get back to you.